Set of 2 air hockey zone (also called strikers, goalies, or handles) made from durable plastic. 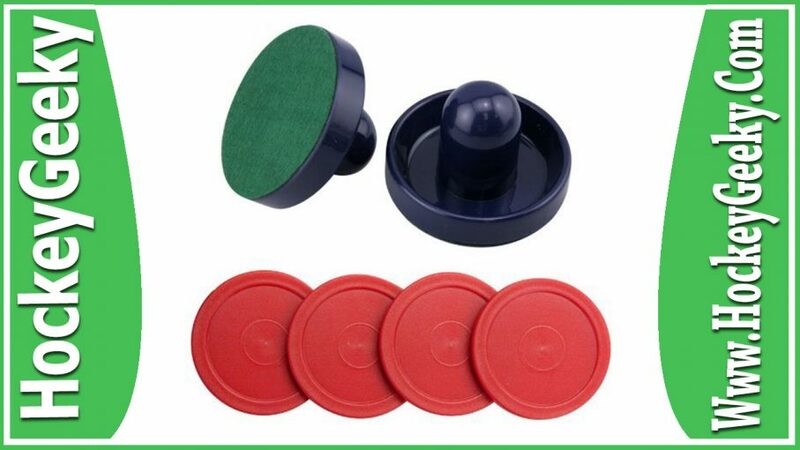 Designed as a replacement kit of zone and pucks for mini air hockey tables or home tables. This is the kind of kit you are looking for when you just want to keep an extra pair of these handy so that the game never stops even when you lose one. 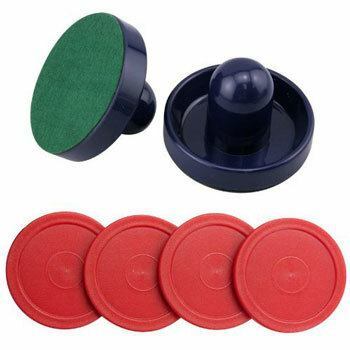 The pucks have got the vintage red color to them and the handles are dark blue in color with green colored felt at the bottom. The product is being sold at a discount price by a reputed seller on Amazon, along with free shipping. The 2-zone included in the kit measure 3-5/8" in width and 2-3/8" in height, which is just the right kind of size to use on a small or mini-sized hockey tables. If you have got a tiny portable table, then these may feel larger for playing on it, which gives you the idea of their size. The pucks are 2-2" in diameter which is roughly the standard size of pucks you will get for the home or mini tables. Having said this, it may not be a nice idea to use this same set on a standard air hockey table or an air hockey competition, because it's not the ideal size for it. Young kids won't find the handles to be too huge to play, just in case you were concerned about that. The last thing you want with a set of sliders is them to slip off from your hand while playing, which won't happen in the case of this set of sliders. The grip seems firm and the handles are comfortable to hold on to even during long sessions of playing. Even kids below the age of 14 won't find it tough to handle them. The sliders do feel sturdy and seem good enough for regular use. The felt is sealed nicely to the bottom, though you need to ward off of bad handling or rough use of the handles or it may start peeling off in the days to come. The zone and pucks are made using a lightweight material. Needless to say, this makes them great for kids. There are some kits on the market which weigh much heavier than this one, which makes them a slightly more bulkier option and certainly not the one if you want a lightweight option. Light weight also means less damage to the things around the table, if your kids are used to playing hard whenever they get a chance. Not just this, much less chance someone would get hurt badly during a rough game or two. Another thing worth keeping in mind is that the pucks that come with this set shouldn't be used for an intense game session or the pucks might simply fly around instead of staying on the table due to the light weight of the material. The strikers come in dark blue color with dark green felt on their bottom giving them the new age look, while the pucks come in the original vintage red color theme. The set does look attractive, even though the design part is just like any other regular kit available on the market. The color combination would go well on a traditional light-colored home table, but not so well on other ones so you will need to see if these ones are okay to use on your table. Apart from that, there's no need to worry about the set looking cheap or low quality because that is not the case with this product. Made of a durable grade of plastic, these sliders and pucks are sure to hold up through an endless amount of nonstop gameplay. When you hold the sliders, however, it may not feel as if these were made up of a sturdy material. That is partly due to the hollow shape and design of the sliders and also due to the ﻿﻿lightw﻿﻿eigh﻿﻿﻿﻿﻿t﻿﻿ material used for the product. There are other products similar to this one available in the market which don't last long and the material used is really cheap plastic. Having said this, this set will certainly last more than a few days on your table, even if the kids go nuts on them. But the material isn't "dog-proof" or break-proof, so you need to "handle with care" as with any other product. The kit costs less than $10 and you get 2 sliders in addition to getting the free shipping offer on top of that. This makes it a nice value-for-money deal, especially when you just want a cheap replacement set lying around at your disposal. It is as cheap as it can get, however, the quality and value is good enough for what it's being sold for. 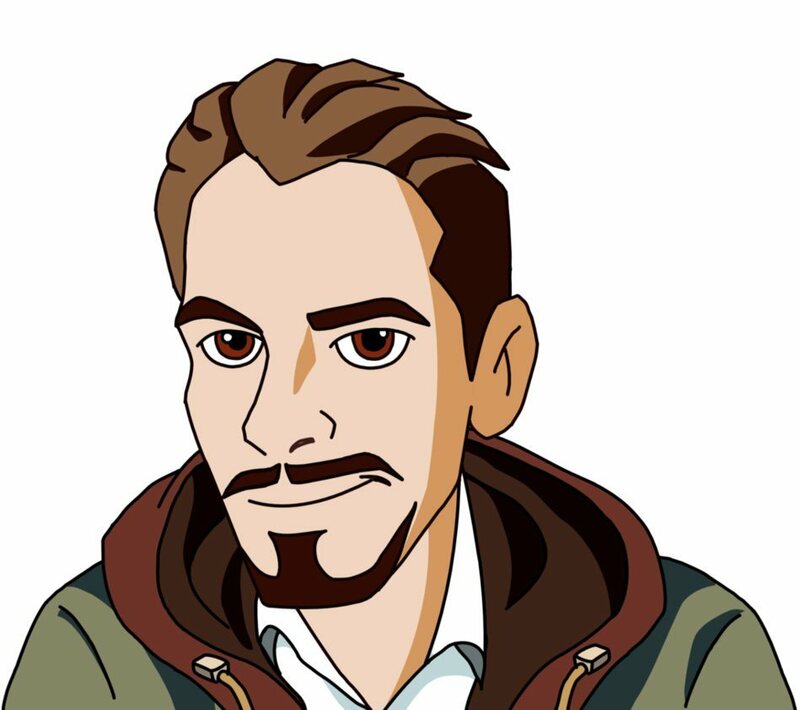 There are other costly options available in the market, but they usually last just as long as these ones, so it doesn't make sense to spend some extra bucks to get a similar kind of a product. Given the price point and value for money, keeping a few of these kits around for those times when the kids lose them or break them apart is a nice idea too. Sliders offer comfy feel and decent grip during gameplay. Non-bulky sliders and pucks, built using lightweight material. Looks attractive, appealing color theme. Doesn't come with fancy packaging, saves money. Good value-for-money and free shipping. Pucks tend to fly off the table fairly easily when hit hard. 2 Dark Blue Air Hockey Pushers. 3-5/8" wide and 2-3/8" high. 4 red air hockey pucks measuring 2-1/2" in diameter. Q: How much do the pucks weigh? Jolly Life's Fantastic Zone Set of 2 Pucks is a great choice for standard or mini ﻿﻿﻿air hockey ﻿tables that need a cheap replacement pair. It's tough to get hurt by the pucks given they are so light in weight, which makes these "kids-proof" as well. Keep these handy for the next time your kids rip apart those handles or the dog chews away the pucks.